Some of my regular readers might notice that my usual response to frustration in the midst of a writing project is to start borrowing writing books from the library and systematically going through them (in addition to eating chocolate, cleaning, and spending too much time on Facebook as an avoidance strategy). A new favorite writing book, chock full of original, well-informed, and practical advice. I’m two volumes into my current stack of five. 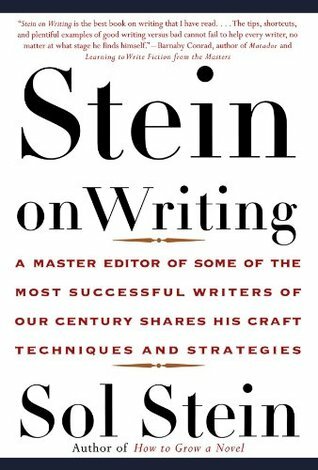 The last couple of days, I’ve been reading Stein on Writing, written by novelist, playwright, and editor extraordinaire, Sol Stein. It’s not a new book, but it’s a classic, and I picked it up due to the acclaim. I’m not done yet, but I’m just loving this book. It’s much more practical than most of the writing books I’ve read, which tend toward the touchy-feely, and after 50 pages of familiar (but articulate) ground (which I probably could use a review of anyway), Stein starts describing all sorts of new strategies for writers to employ.